How is it possible that people in Genesis lived 900+ years? I do not necessarily see the need to prove the Bible scientifically, but I do belief that the Bible is accurate. Therefore, I believe that Adam, Noah, Methuselah, etc., really did live 900+ years. Whether or not there was some sort of water canopy or not, I don’t know, but it does appear that the reduction in life span started happening following the Flood, so the most likely explanation in my mind is that there was some sort of change that happened as a result of the flood. If you follow the genealogies listed in Genesis 5, the Flood takes place 1656 years after Adam’s creation. There are 9 generations between Adam and Noah. Noah was 600 when the Flood began, so those 9 generations are spaced across approximately 1000 years. After the Flood, there are another 9 generations from Shem to Abram. 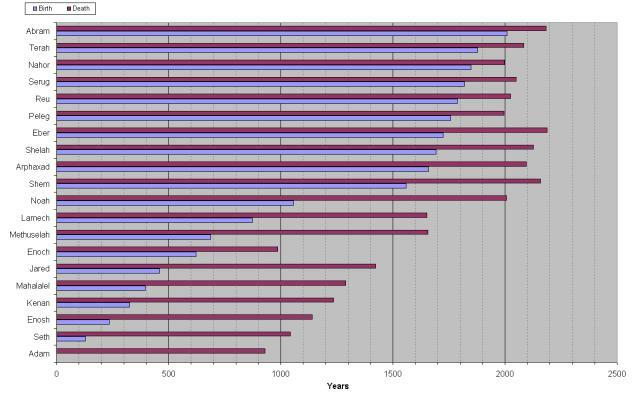 Using the ages listed in Genesis 11, these 9 generations span 450 years. 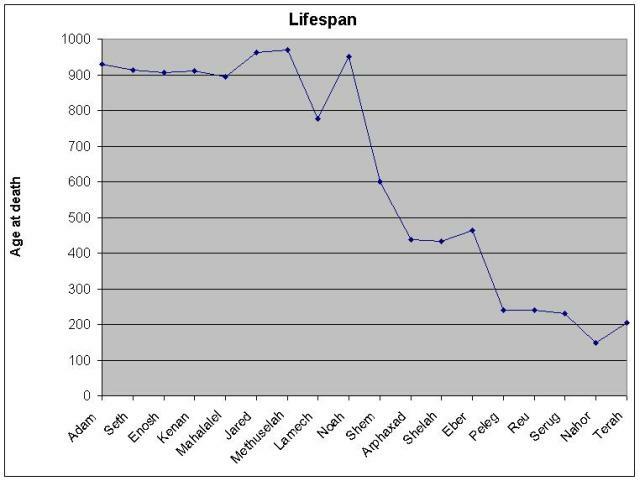 Looking at the total lifespan of all these individuals, it’s relatively flat until Noah (although Lamech died a bit “young”), and then it starts a steep decline (see attached image; note: I left out Enoch since he didn’t actually die). It seems reasonable to me that the Flood during Noah’s time played a role in shortening the lifespans. If the shortened lifespans were due to the fall of man back in Eden, or the absence of the Tree of Life fruit, you should see a steady decline. It should also be noted that the scale of the curve may be deceiving. I show all the generations equally spaced, but in reality the “flat part” from Adam to Noah spans a time period more than twice as long as the “decline” from Noah to Terah. If I scaled the x-axis according to time, the drop-off would appear even more distinct. 5:32) – all in one year? Shem was 100 when he fathered Arphaxad (Genesis 11:10). Genesis 11:10 also reveals that Arphaxad was born 2 years after the flood. Since the flood started with Noah was 600 years old, Arphaxad was born when Noah was 602 years old and Shem was 100 years old. That means Noah was 502 when Shem was born. Genesis 5:32 most likely means Noah was 500 years old when he became a father. Since Ham is referred to as the youngest in Genesis 9:24, and Shem was born when Noah was 502, the son he had when he was 500 must have been Japheth. The confusing thing is that some translations refer to Shem as the “older brother of Japheth” in Genesis 10:21, whereas other translations refer to Shem as the brother of “Japheth the elder.” While Japheth, Shem, Ham seems like the most likely birth order to me, that’s a topic for another thread. This doesn’t have anything to do with WHY people lived a long time or what happened to change that, but here’s another interesting look at the various lifespans. Shem was still alive for another 150 years after Abram was born. I don’t have Isaac on the chart, but Abraham had Isaac when he was 100, so Shem was still around for another 50 years after Isaac was born. I don’t know if they lived in the same area or not, but it’s possible that Isaac knew his great, great, great, great, great, great, great, great grandfather. Shem could have even been at Isaac and Rebekah’s wedding (Isaac was 40 when they got married), but he missed Jacob and Esau by 10 years (Isaac was 60 when they were born). This entry was posted in Scripture and tagged age, generations, Scripture by Steve Long. Bookmark the permalink.